Sadly spring break in Siberia is now off-limits to Senator John McCain and other US Representatives thanks to Vladimir Putin’s retaliatory sanctions. Oh, for the good old days of the Soviet Union when American capitalists were once welcomed with open arms. 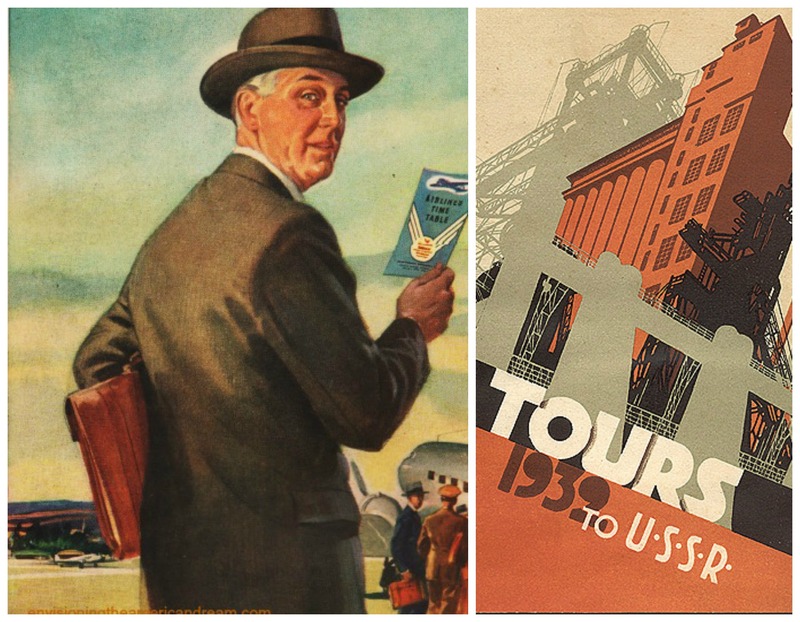 Tourism to Soviet in the interwar years is usually thought of as a smattering of intellectuals, and fellow travelers. But it wasn’t just the idealist leftists who wanted to take a vacation in the USSR. It was red-blooded American businessmen. 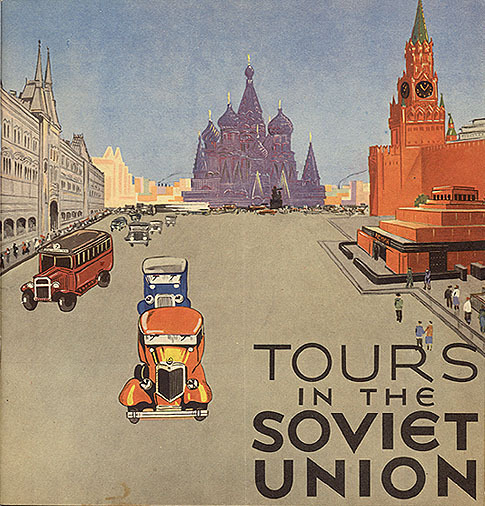 Before the cold war froze out tourism, Soviet Russia actively wooed American tourists. 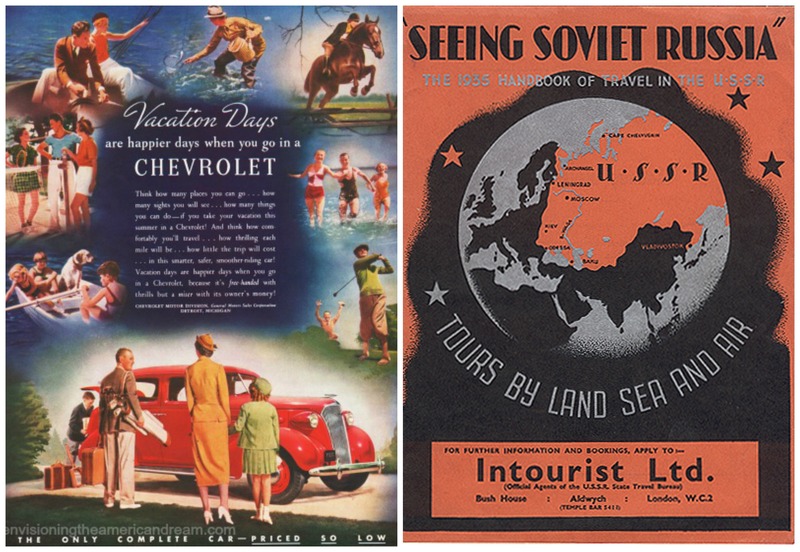 To help sell the Soviet Union as a travel destination to Americans during the interwar years, Joseph Stalin created Intourist in 1929 as the official state travel agency of Soviet Union. Not only was it a full service travel agency offering tours, it peddled an idealized vision of the Soviet State to foreigners. What could be more appealing to red white and blue Americans. March 1932 cover Fortune magazine The ” Great Soviet Experiment” even rated a cover story, painted by Diego Rivera. The accompanying article fairly rhapsodized on the marvels of Soviet system. It may seem incongruous to find an ad for the Soviet Union in the glossy pages of Henry Luce’s homage to American business. 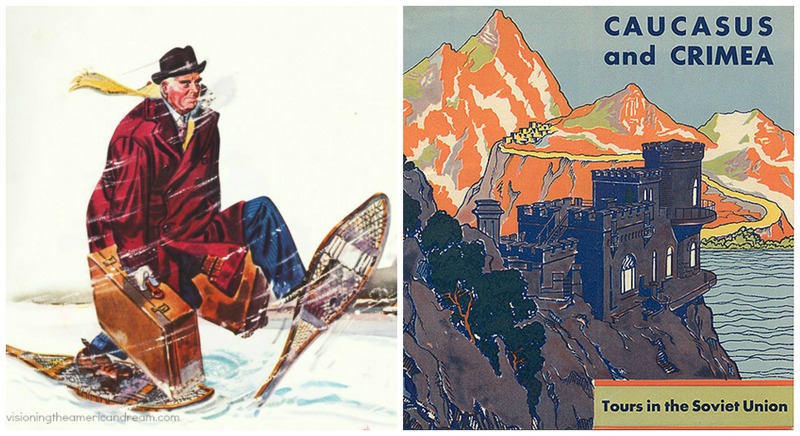 But nestled between ads for luxury cars, boats and brokerage houses, Intourist placed advertisements in nearly every issue of the mammoth monthly magazine. “Visit the new and the old in highly individual cities of Soviet Russia where gigantic new planning is altering social forms and yet preserving the notable art treasures of older times,” entices the copy in this ad from April 1932. Travel dreams would open up other horizons as well. Besides the art treasures and diverse beauty of the Soviet Union, some red-blooded American were also interested in lining their pockets. Though diplomatic relations between the 2 nations would not be established before 1933 when FDR chose to formally recognize Stalin’s Communist government (ending almost 16 years of American non-recognition of the Soviet Union), American business were already busy tapping into this large market. The US had refused to recognize the government in Moscow after the Bolsheviks took control in 1917. 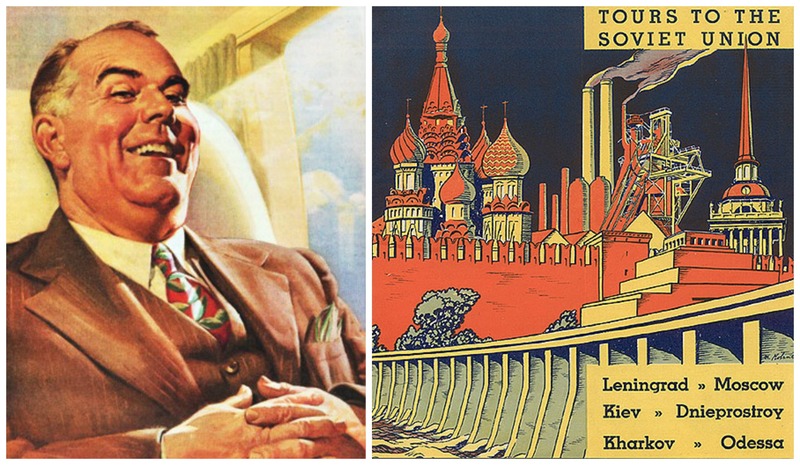 Despite the Red Scare here at home throughout the 1920s, Washington gradually lifted overseas trade and investment opportunities for American business in Russia. 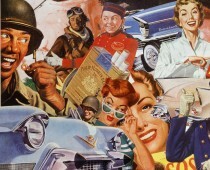 Soviet Russia soon became a major America market. By 1930 American exports to Russia exceeded in value those of every other country and naturally Americana business relied on this export market. Not surprisingly most experts agree that this commercial and economic relationship strongly influenced formal recognition. We may have been scared of Red but we loved green.